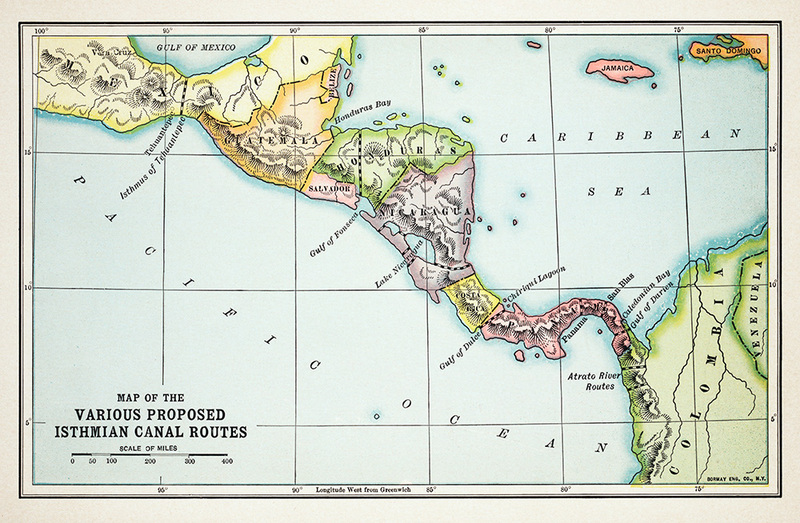 Detail of Napoléon Garella’s mid-century proposal for a canal route in Panama, from Projet d’un canal de jonction de l’océan Pacifique et de l’océan Atlantique á travers l’isthme de Panama. Interest in an artificial waterway between the Atlantic and Pacific Oceans in the 19th century came from many directions. Alexander von Humboldt’s ideas on the subject were among the most influential, if for no other reason than for drawing attention to the question. Humboldt’s long essay on the topic of a canal across Central America appeared in his Political Essay on the Kingdom of New Spain, in 1811. By mid-century he had become one of the most famous people in the world, and his views on the importance of a canal became widely known. 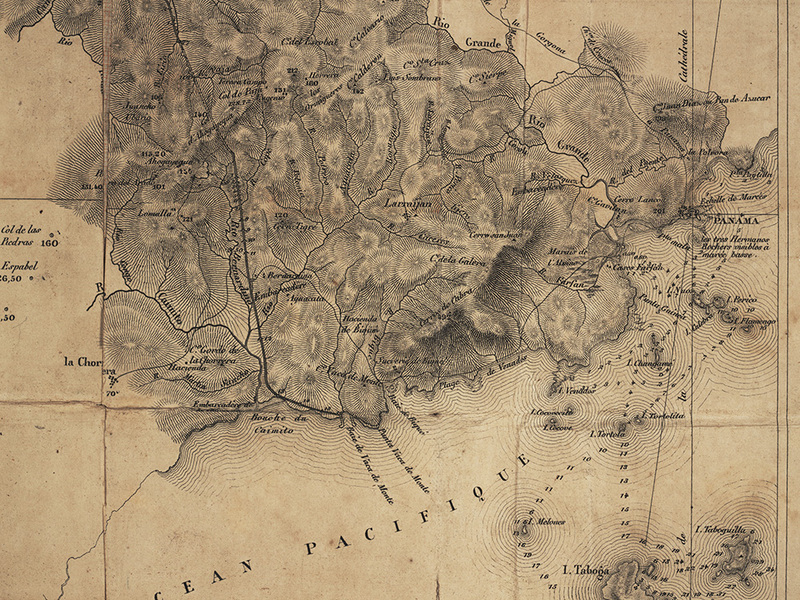 Napoléon Garella, an engineer sent by the French government in 1843 to study the question of a route across the Isthmus of Panama, recommended a canal from Limon Bay to the bay of Boca del Monte, twelve miles west of Panama City. Nothing came of this proposal, as the project could not attract enough funding to go forward. The map published with Garella’s report, however, is remarkably detailed and clearly shows the route of his proposed canal. Portrait of Alexander von Humboldt, from his Cosmos: sketch of a physical description of the universe. New York , 1859-1860. Alexander von Humboldt explored South America for five years, from 1799-1804. His published account of those explorations brought him world-wide fame. His Cosmos, written in the 1840s and 1850s, was intended as a universal analysis of geography and natural science. It expanded into an attempt to unify all the sciences, and it also was very popular. 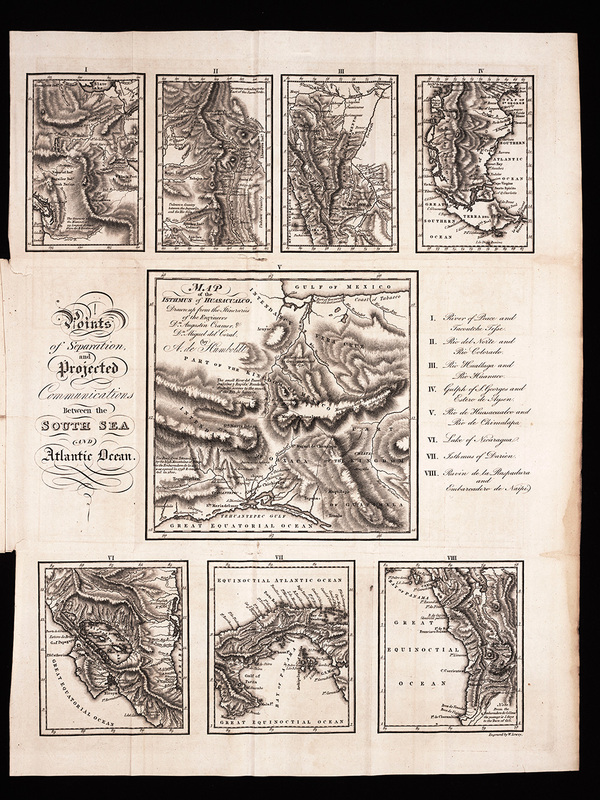 Although his travels never took him to Panama or Nicaragua, his views on the subject of a transcontinental route through those regions were highly regarded and served for many as the basis for further research on the subject. Map of Humboldt’s proposed routes for passage between the Atlantic and Pacific Oceans. From his Political essay on the kingdom of New Spain. London, 1814. 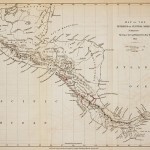 Alexander von Humboldt included a long essay on the topic of a canal across Central America in his Political Essay on the Kingdom of New Spain. When he wrote it (in French) in 1811, he was relatively unknown, but by mid-century he was widely recognized for his scientific views and achievements. 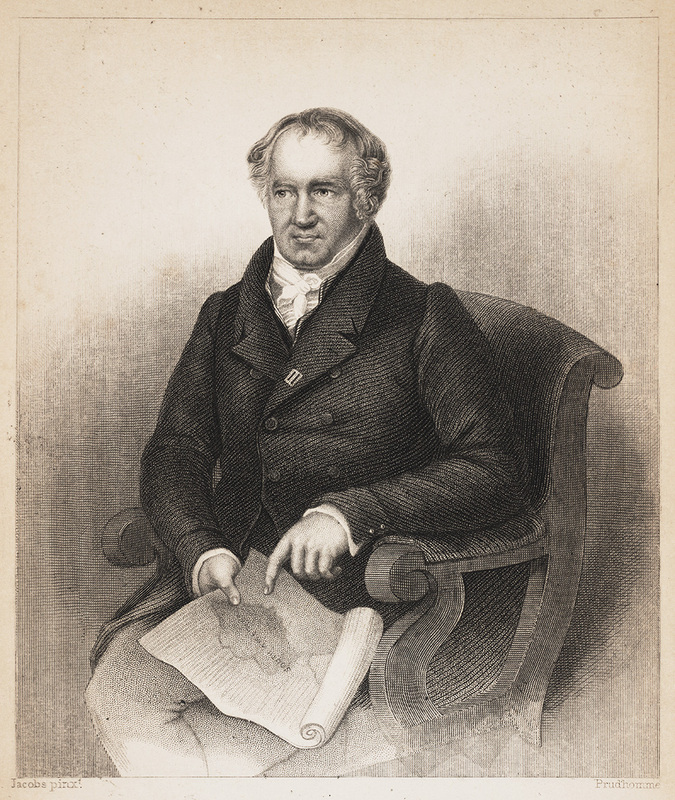 As a result, his views on the importance of a canal became highly influential. A canal in Panama, he concluded, was the worst of nine possible options that he considered. Although he had traveled and explored Spanish America for five years, he had never been to Panama. And neither had he been to Nicaragua, which he thought had the best option for a canal route. His research was based on the study of maps and documents that were made available to him during a year of research in Mexico. Map of Humboldt’s proposed routes for a canal.From W.F. Johnson, Four centuries of the Panama Canal. New York, 1907. 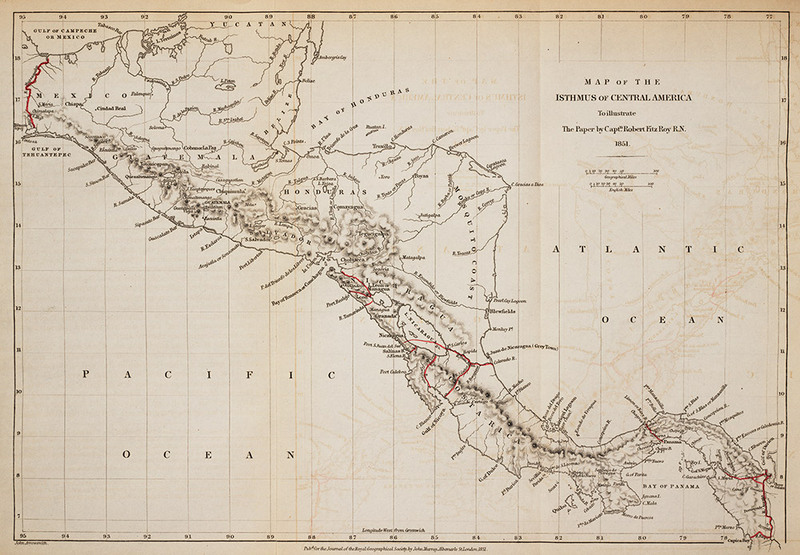 Nearly a century after he first proposed them, Alexander von Humboldt’s various routes for a connection between the Atlantic and Pacific Oceans were still a subject for study. 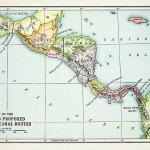 Every one of the proposed Isthmian canal routes shown on this map from 1907 was originally proposed by Humboldt in his 1811 treatise on the Kingdom of New Spain. At this point, American efforts at digging the canal route through Panama were progressing vigorously. 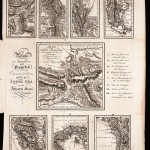 Fitzroy’s “Map of the Isthmus of Central America”. From R. FitzRoy, “Considerations on the great Isthmus of Central America,” in Journal of the Royal Geographical Society of London, 1851, vol. 20. 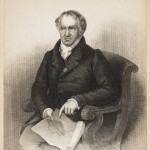 Robert Fitzroy was captain of HMS Beagle, the ship that carried young Charles Darwin on a voyage around the world in the early 1830s. In 1850, Fitzroy compiled this report on what was considered one of the most important public questions of the day, “the union of the Atlantic and Pacific Oceans by a navigable channel through the great American Isthmus.” After studying the “illustrious” Humboldt’s earlier report, Fitzroy concluded that the best route was one shown at the very lower right of the map, in what today would be northwestern Colombia. The route goes from the Atlantic at the Gulf of Darien, up the Atrato River, and then by canal to Cupuica Bay on the Pacific side. The Panama route, the one where the canal ultimately was dug, was best only for a road, or possibly a railroad, Fitzroy concluded.